Raumfahrt+Astronomie-Blog von CENAP - Blog: Raumfahrt - IS IT A BIRD? IS IT A PLANE? Head of ESA’s ɸ-lab Invest Office, Amanda Regan, noted, “We’ve never before had so many opportunities for Earth observation and we have to take advantage of all of this. “There is, for example, open and free access to long-term systematic data through the EU’s Copernicus programme, technology improvements such as miniaturization, advances in information and communications technologies for all the data we are getting, a flexible ecosystem approach to help bring everything together and reusable launchers offering easier access to space. 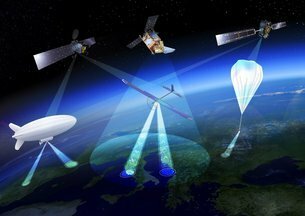 High Altitude Pseudo Satellites, or HAPS, are just one of the forms of technology that help take Earth observation into the future. While a traditional weather balloons could be considered as HAPS, this emerging technology is designed to float or fly at high altitude like conventional aircraft but operate more like satellites. But rather than working from space they can remain in position inside the atmosphere for weeks or even months, offering continuous coverage of the ground below. In addition to this novel type of platform, participants have also been discussing the benefits of small satellites. Jaan Praks, from Aalto University Finland, said, “Small satellites have the potential to measure the heartbeat of the entire planet in real time. In addition to these and other platforms, we have also seen the advent of taking video from space with Earth-i’s VividX2, which is a very high-resolution satellite that deliver real-time video from space.